Europe is Worth a Visit! 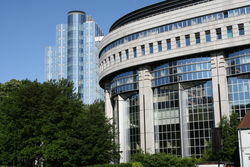 Twice a year Constanze Krehl offers guided tours to the European Parliament in Brussels and Strasbourg. The three-day trip begins at a central location in Saxony, which varies according to each group’s origin. In Brussels or Strasbourg you will get the chance to visit the Parliament’s premises and to actually watch part of a plenary debate. The Parliament’s visitors’ service will introduce you to the functioning of the European institutions and Constanze Krehl will tell you about what it is like to be an MEP. Depending on the individual interests of each group, we will organise further meetings with representatives of the other institutions, such as the European Commission, trade unions and foundations. Apart from that, we would host two dinners as well as a guided tour of Brussels or Strasbourg. We charge €70 per person for each trip. This sum includes the programme mentioned above, travel expenses and accommodation. Please be aware that all meetings and guided tours will be in German. There is very high demand for participation in our excursions. Unfortunately the number of annual participants is limited. We would therefore kindly ask you to excuse us, if we cannot currently accept new registrations. In spite of this, we would like to recommend the Herbert-Wehner-Bildungswerk’s guided visits to Brussels.